Click image to enlarge Hamilton Creek, North Bonneville, Washington. Image taken October 27, 2004. Hamilton Creek originates in the Cascades and flows south/southeast, passing between Aldrich Butte and Hamilton Mountain before it reaches North Bonneville, Hamilton Island, and the Columbia River, where it enters the river at River Mile (RM) 143. 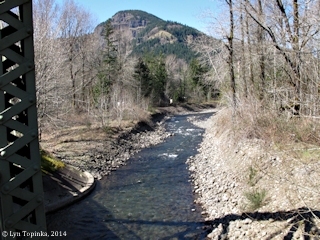 Downstream is Hardy Creek, Beacon Rock, and Woodard Creek. Upstream is Greenleaf Creek and Greenleaf Slough. 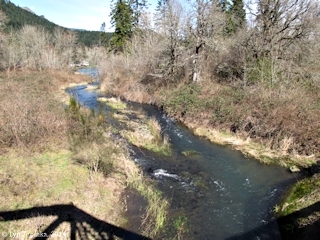 Greenleaf Creek joins Hamilton Creek just upstream of the Evergreen Drive bridge, north of Washington State 14. Hamilton Creek, along with Hamilton Island and Hamilton Mountain were all named for Samuel M. Hamilton of Lower Cascades, who took a Donation Land Claim on the Hamilton Creek in 1850. An 1860 cadastral survey (tax survey) map for T2N R7E show's the "Hamilton Creek" name on today's the Greenleaf Slough and lower Hamilton Creek, forming the north/northwestern channel separating Hamilton Island from the Washington mainland. The U.S. Bureau of Land Management, General Land Office Records, show a Samuel M. Hamilton being issued a land title on September 20, 1870, parts of T2N R7E Sections 29 and 30, under the 1862 "Homestead Entry Original"
Lewis and Clark passed by Hamilton Creek and Hamilton Island on October 31, 1805, calling Hamilton Island "Strawberry Island". "... 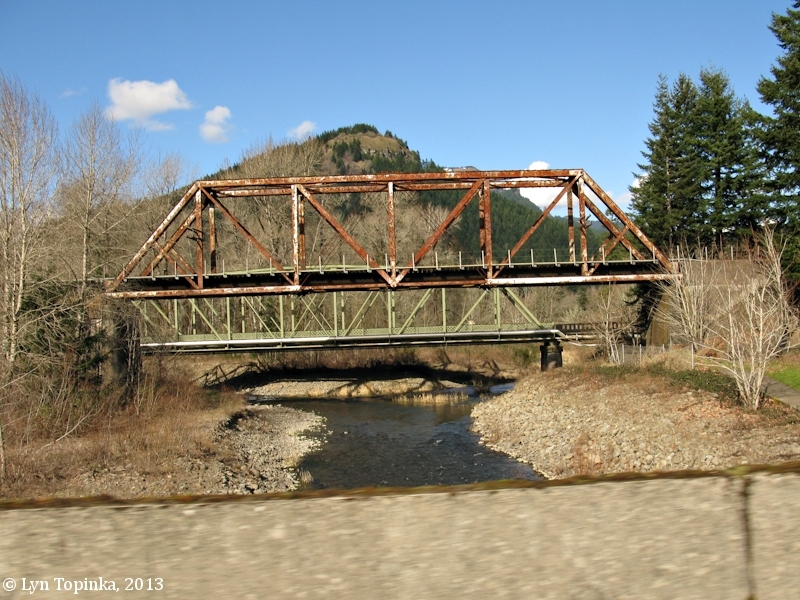 This creek historically entered a side channel of the Columbia River between the mainland and Hamilton Island. During construction of the second powerhouse at Bonneville Dam, the upstream portion of the side channel was filled to join Hamilton Island to the mainland and the downstream portion became an extension of Hamilton Creek. 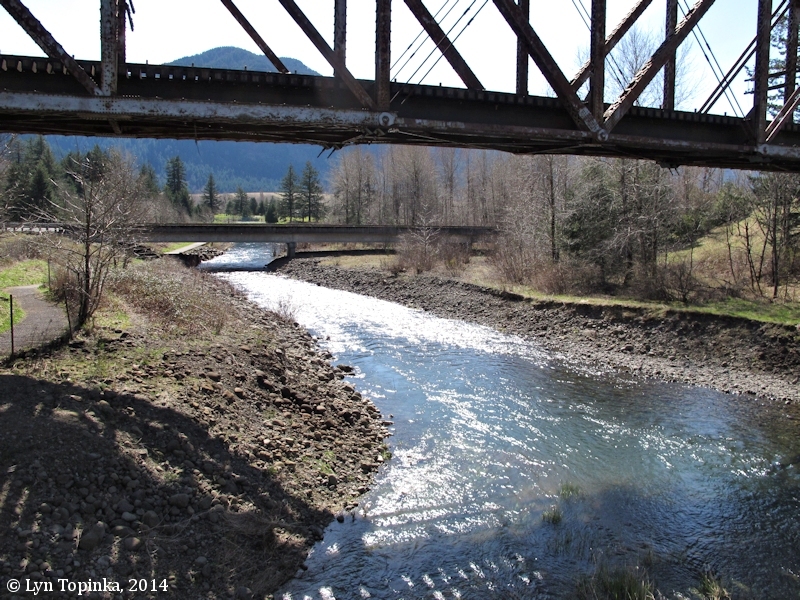 Hamilton Creek now flows directly into the Columbia River mainstem. In the early 1960s, an artificial spawning channel was constructed in the lower section of Hamilton Creek and is referred to as “Hamilton Springs”. Hamilton Springs provides the majority of spawning habitat in this drainage. ..."
Source: Bonneville Power Administration website, 2006. Hamilton Creek supports one of the last remaining runs of chum salmon on the Columbia River. According to the U.S. Fish and Wildlife Columbia River Fisheries Program's FY2000 Annual Report, in the early 1960s, an artificial spawning channel was constructed in the lower section of Hamilton Creek and is referred to as "Hamilton Springs". Hamilton Springs provides the majority of spawning habitat in the Hamilton Creek drainage. 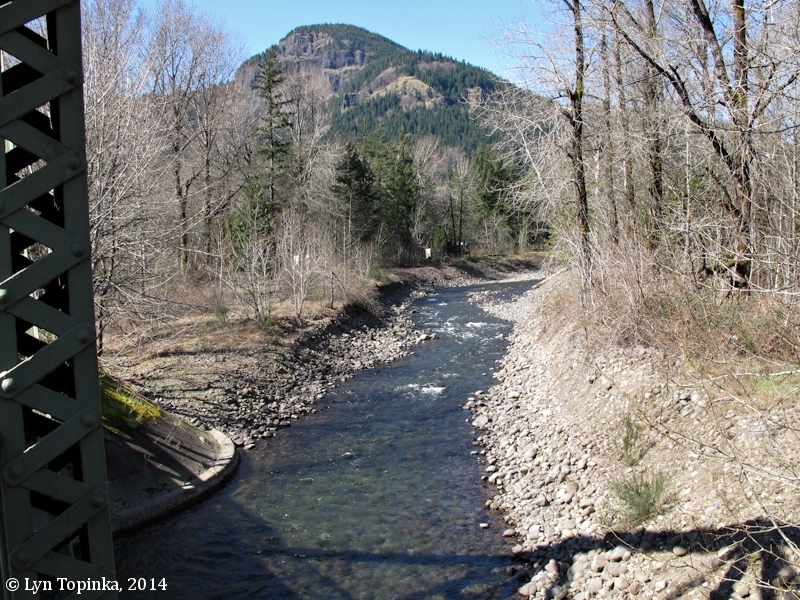 Water flow is largely controlled by groundwater springs which provide a very stable environment for chum salmon. 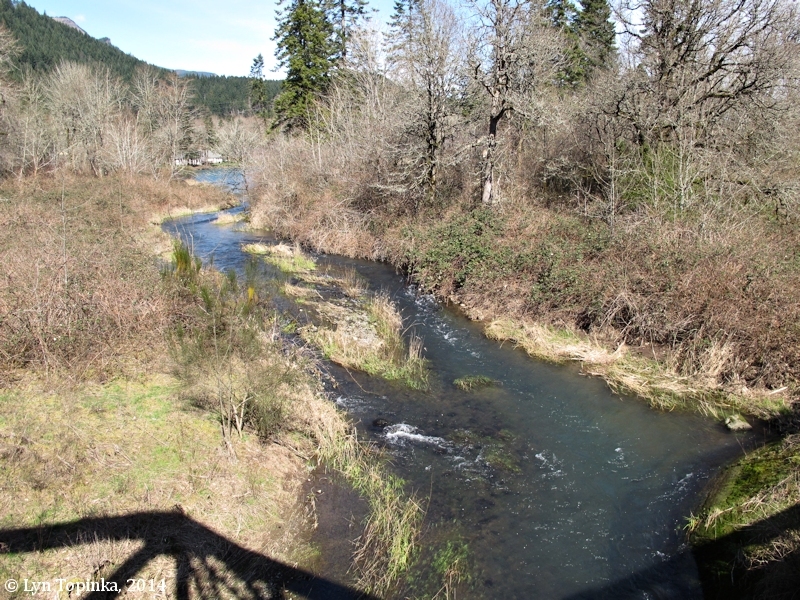 Nearby Hardy Creek also supports a chum salmon run. 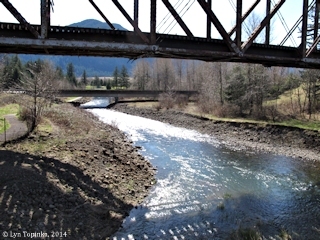 Click image to enlarge Hamilton Creek looking upstream from Evergreen Drive Bridge, North Bonneville, Washington. Image taken March 21, 2014. 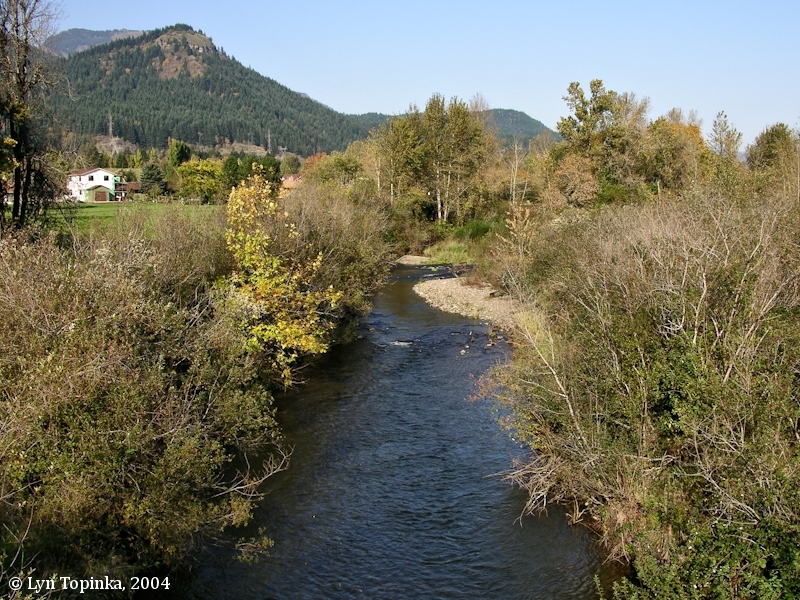 Click image to enlarge Greenleaf Creek where it joins Hamilton Creek, looking upstream from Evergreen Drive Bridge, North Bonneville, Washington. 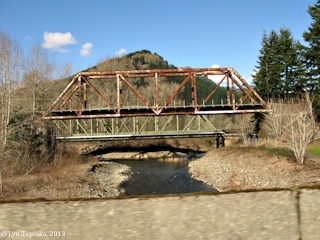 Image taken March 21, 2014. 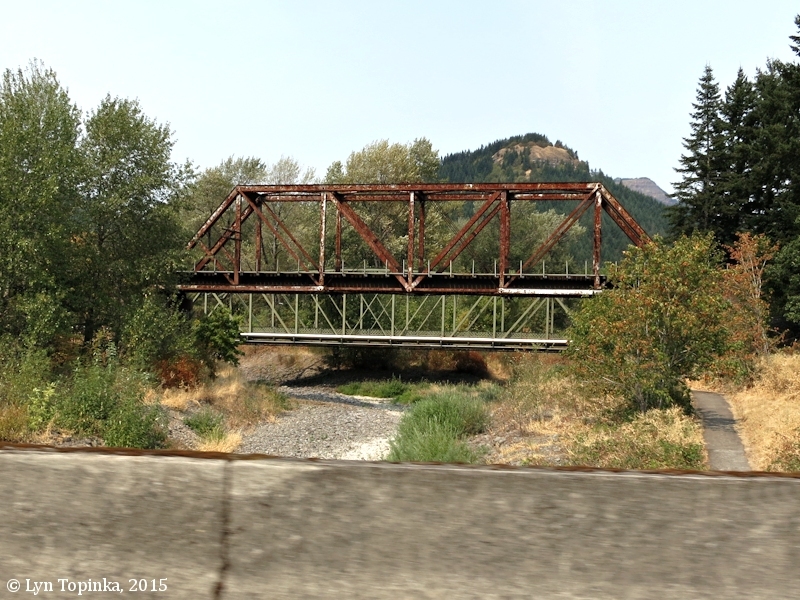 Click image to enlarge Hamilton Creek, looking downstream from Evergreen Drive Bridge, North Bonneville, Washington. The Railroad bridge is in the foreground with Washington Highway 14 bridge in the background. View from Evergreen Drive. Image taken March 21, 2014. Click image to enlarge Hamilton Creek, North Bonneville, Washington. View from while driving Washington State Highway 14. 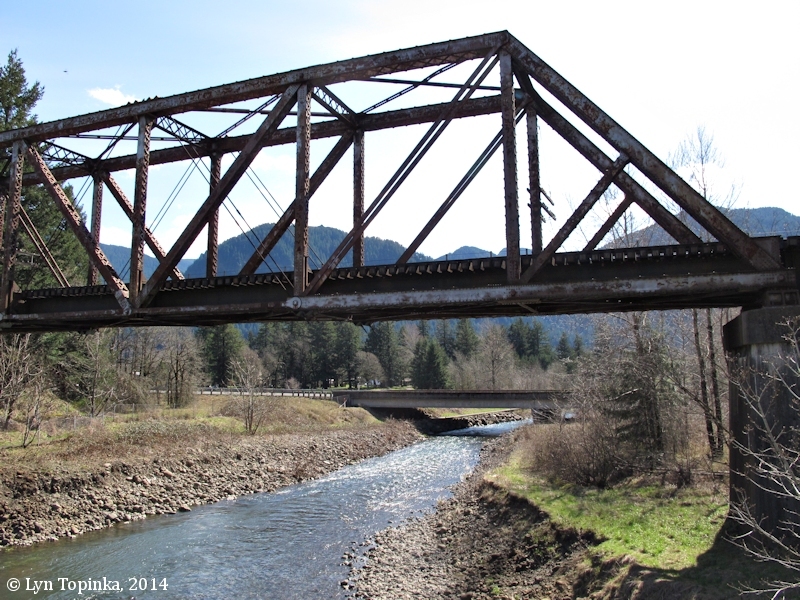 The Railroad bridge is in the foreground (sits higher) with Evergreen Drive bridge in the background (sits lower). Image taken February 19, 2013. Click image to enlarge Hamilton Creek, North Bonneville, Washington. View from while driving Washington State Highway 14. The Railroad bridge is in the foreground (sits higher) with Evergreen Drive bridge in the background (sits lower). Image taken August 26, 2015.